When looking for a lost pet, consider calling all shelters in the surrounding area. Animals travel and someone could have picked up your pet and brought it to a shelter far from your home. The following is a list of Cairns who have wandered from their homes. They are grouped by state, and the states are in alphabetical order. 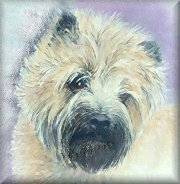 Cream brindle Cairn Terrier. She needs medical care, please help us get her home. There is a large reward for her return, or information that leads to her return. About a foot tall and 14 lbs. Lost her collar, but she has a PetTrac locator chip implant that can be detected by vets and humane societies. About 7 lbs, Black Terrier Mix. Reward offered. About 20-22 lbs., dark grey. Missing upper left second incisor tooth, slight chip off end of upper left eye (canine) tooth, very slight underbite; white beard; large blackish freckle on lower right of otherwise very pink belly; longish silkier hair than is typical for Cairns; long ear tassels; possible warty-looking bump on upper right bridge of snout. Wearing 2 collars: one is black/white patterned nylon, the other is a purple choke. Tricks: not many, just "sit up" and "show me your belly." Takes a lot of standard commands and has a large vocabulary to which he reponds with great enthusiasm: breakfast, dinner, cookie, bowl, walk, leash, car, ride, kitchen, bed, binky (toy) etc. Wearing 2 collars with Malibu and El Cerrito (N.Ca.) ID tags and expired Contra Costa county license tag and has AVID microchip. He is black and grey, but if you look near his skin, you can see some apricot fur. He was wearing a black collar with his rabies tag and an Allegheny County dog license. He is a smart doggie, and clearly knows his name. Bolting out his front door in the Fox Chapel area of Pittsburgh (northeast of downtown). Rabies tag & dog license for Allegheny Co. 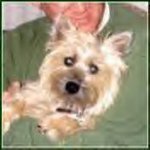 REWARD: Harley is a wheaten 14-yr-old, unneutered male Cairn Terrier. He has some gray in his coloring. He has a skin allergy and was missing some coat from his hind quarters. He is very much a house dog. He weighs in at about 20-23 lbs. Substantial Reward is being offered. Lost in the Cherry Hill Subdivision in the North area of Jackson, TN. Supposedly last seen trotting along McClellan Road toward Princeton Estates Subdivision in the same area. No ID; No collar; No microchip. 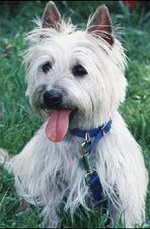 REWARD: Alice is a wheat colored Cairn with a spot on her rump with short black hair from an old wound. She has been clipped and the hair has grown back some and is about an inch or so long. She is spayed. Between Highland and Semmes on Spottswood in Memphis. She has a doggie door and when the owner went to work, the dog was there. The dog was gone when she got home. Badge is neutered, light wheaten, and weighs 18 lbs. His tail curls over his back and he has a small wart-like mark on top of head. He was wearing a red collar with a blue name tag (phone number on the back). He knows how to sit up, beg, and roll over. At home in Euless before it was burglarized. 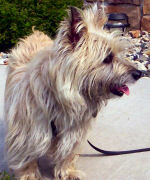 Hooptie is a red male cairn terrier, almost 14 years old (born 1987), ears up, feather tail, 17 pounds, no collar. 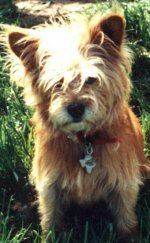 Hooptie was with us 12 yrs, and is missed very much. We need to know if he is safe and sound and loved.